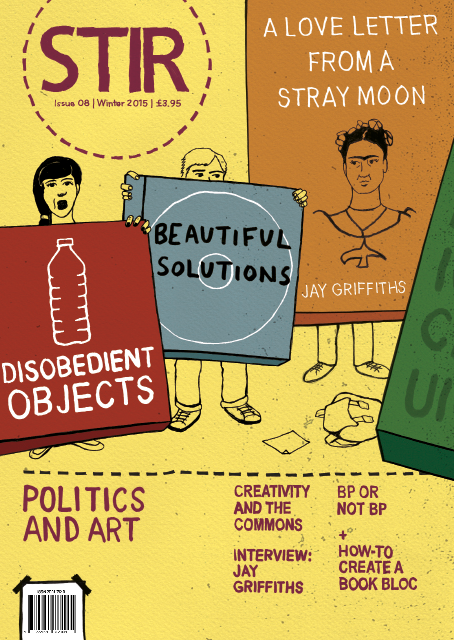 My article “Creativity and the Commons” has appeared in the Winter 2015 issue of STIR, a magazine about co-ops, community and commons. You can order a copy here: http://stirtoaction.com/. French realist painter Gustav Courbet (1819-1877) is, at first glance, the quintessential modern artistic persona: arrogant, iconoclastic, moody, brilliant and individualistic. He was also an anarchist who served as the short-lived Paris Commune’s (1871) de facto Minister of Culture, developing programs that empowered artists and opened museums and galleries to the public. 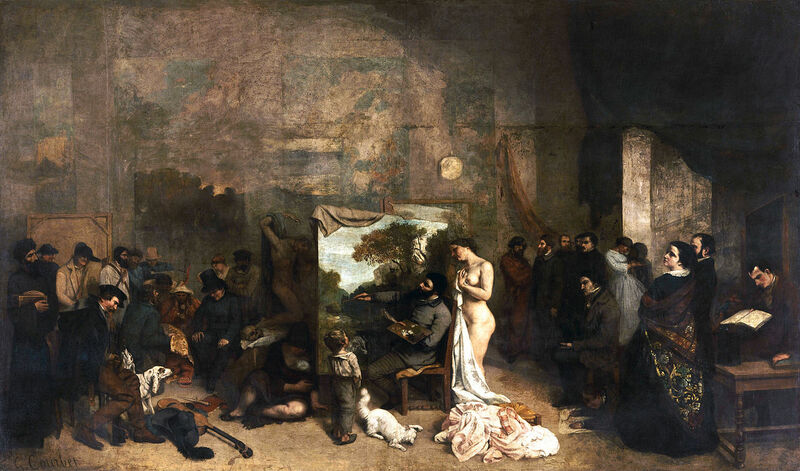 It is towards figures like Courbet that our imaginations are trained to gravitate when we hear the word creativity. But his famous (and, at the time of its first exhibition in 1855, infamous) large-scale The Artist’s Studio, a real allegory summing up seven years of my artistic and moral life reveals something profoundly different about the nature of creativity. Here, the artist depicts himself seated in the centre of the scene, painting a landscape in his studio, surrounded by a cast of dozens of characters. “It’s the whole world coming to me to be painted,” he wrote, “on my right, all the shareholders, by that I mean friends, fellow workers, art lovers. On the left is the other world of everyday life, the masses, wretchedness, poverty, wealth, the exploited and the exploiters, people who make a living from death.” The painting represents a tacit admission that art, and creativity more broadly, is not merely the unique effusion of the tortured genius’s soul, but rather always a partly collective and common process: it relies on a whole community of people. Readers of STIR will no doubt be familiar with the concept and politics of the commons and the struggle against enclosure, so I will not revisit them here except to say that creativity is an elemental part of the commons and of struggles to defend, expand and reinvent them. 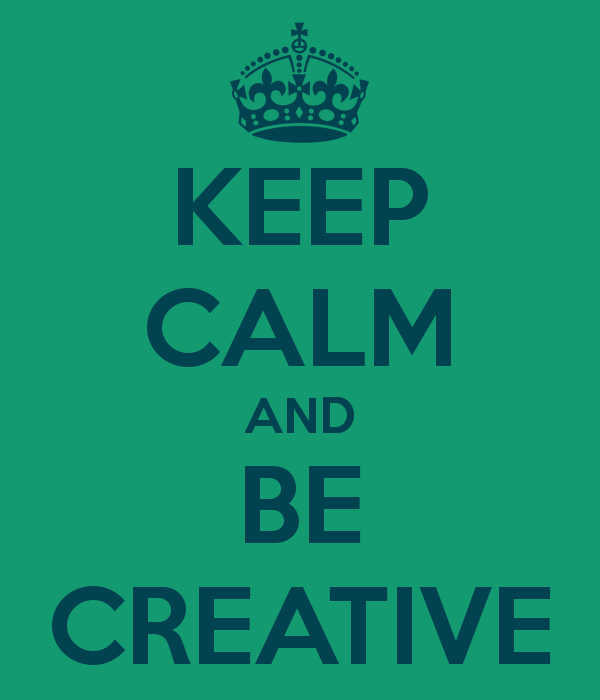 Indeed, creativity itself can be understood, at least in part, as a commons. Consider, for instance, the incredible creative gifts that have emerged from the Black experience in the United States. As historian and philosopher of cultural politics Robin D.G. 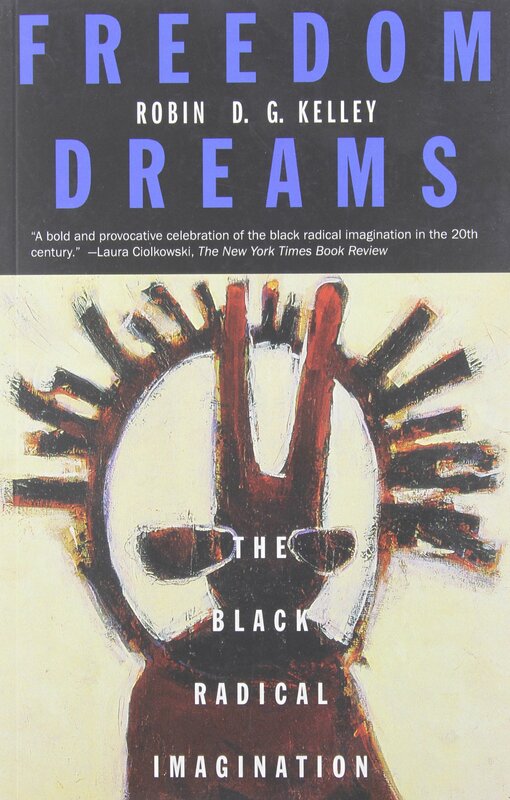 Kelley has shown in incredible book Freedom Dreams: The Black Radical Imagination, cultural forms from gospel to blues to jazz to funk to hip-hop emerged collaboratively from popular movements against racism and exploitation.They served, at least initially, as catalysts for common struggles. But, likewise, these cultural forms have each been the subject of enclosure by the music industry, advertising and other capitalist forces eager to transform these into opportunities to sell cultural commodities, and in the course of this process the history of collective, collaborative creativity is distilled into a lineage of individual figures. That is to say that creativity always emerges from a context of shared and collectively cultivated cultural and intellectual “resources,” and in turn contributes to that context, and that the politics of creativity are in many ways defined by capitalism’s attempts to conscript, shape co-opt or charge rent for access to that creative commons. 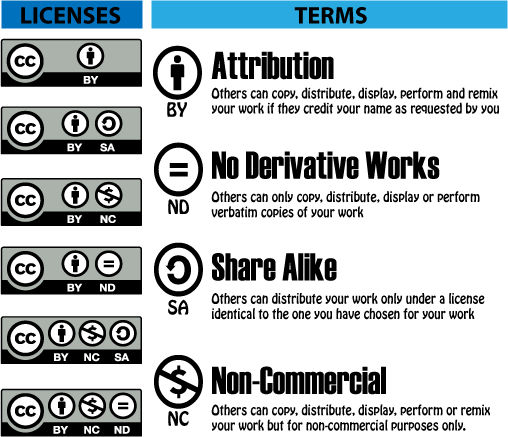 Indeed, this is the key argument of the Creative Commons licensing platform, an open-source initiative that allows creative producers, from musicians to artists to programmers, to “copy-left” their work, acknowledging its shared sources and its contribution to a shared cultural landscape while at the same time affording the option of ensuring authorial recognition and preventing future profiteering. This argument may sound a bit odd or abstract because we are accustomed to imagining creativity in highly individualistic ways, ways that are fundamentally shaped by a capitalist worldview. Indeed, the idea of creativity, at least in the English language, only emerges as a distinct and recognized term amidst the rise of capitalism, the enclosure of the original commons and the processes of European colonialism and imperialism. This makes disentangling creativity from capitalism and developing a notion of the creativity of the commons fairly difficult, but also well worth attempting. Essentially, the idea of creativity came into existence primarily to give cultural commodities added value. 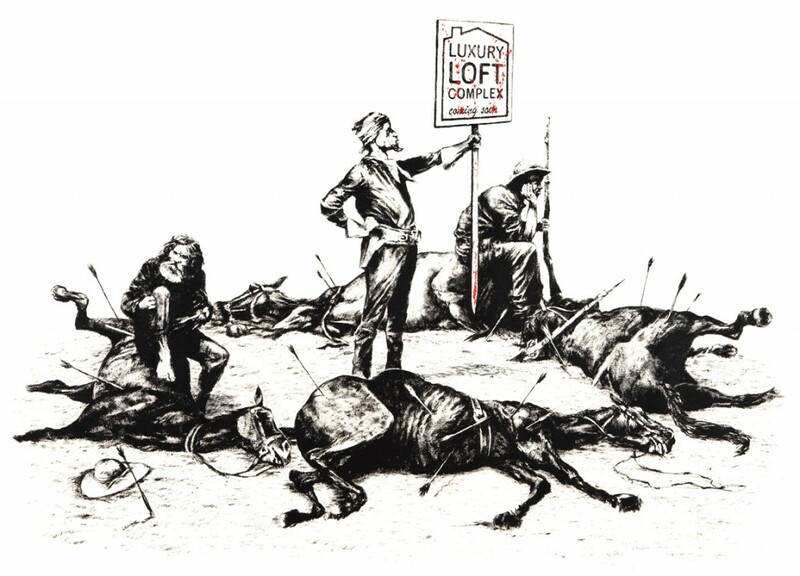 As the capitalist class was forging itself in the 17th and 18th centuries, largely based on their ability to expropriate and profit from commons lands and resources, they began to demand the means of what French sociologist Pierre Bourdieu called “distinction:” artifacts and social practices by which they could set themselves apart and afford themselves an exalted self-image and class solidarity. Unlike their aristocratic predecessors, the new capitalist class made no pretence towards some sort of inherited biological superiority. They wished to believe that their wealth and success was due to intelligence, cunning, hard work and entrepreneurial spirit. But in order to reproduce this illusion, and to cultivate a community of like-minded ruling class persons, a range of social institutions were required: elite schools and clubs, professional associations and guilds, and, importantly, a sphere of cultural refinement and cultivation. New cultural forms, from the novel to opera to private paintings to fine crafts emerged to meet the demand of a rising class of individuals eager to showcase not only their wealth but also their intellectual and cultural superiority. The value of these commodities, both in terms of how much money they cost and their usefulness in reproducing ruling class culture, was based, at some fundamental level, on the signature of the unique artist, the authentic and singular mark of the individual, which guaranteed the uniqueness of the cultural work in question. Around this figure of the unique artistic persona, the capitalist mythology of creativity grew. Creativity, it came to be understood, emerged from the divine wellspring of the individual soul. The white, male European artist achieved a celebrated status. 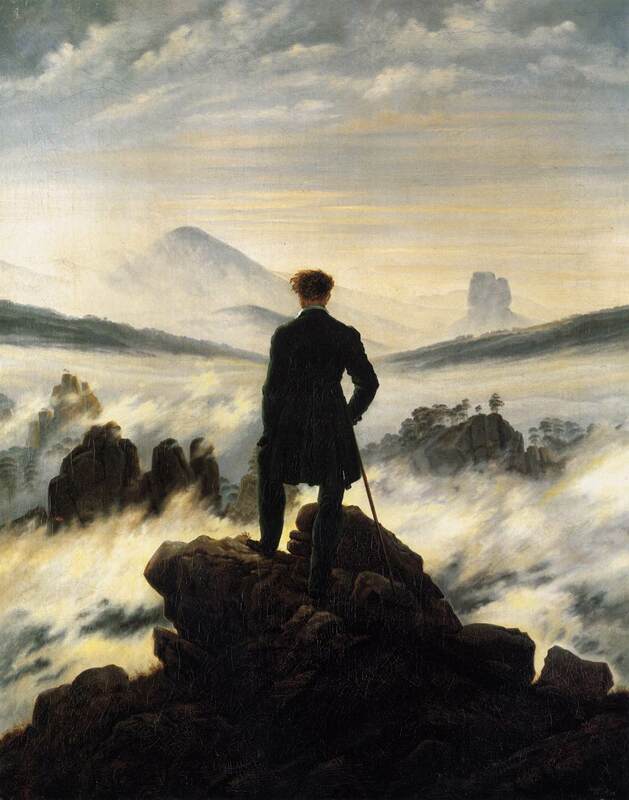 While some of the earliest proponents of the idea of individualistic creativity posed this romantic ideal against the growing corrosive power of capitalism and in contrast to the crass and base cupidity of the businessman, the archetype was quickly enclosed: the artist came to be seen as the glamorous mirror image of the entrepreneur, the heroic, driven individual who tamed chaos and created profitable beauty and order in the world through force of will. Such a mythology of individualistic, capitalist creativity depended (and still depends) on the defamation and degradation of its “others.” The emergence of a bourgeois culture based on the ideal of individual creativity was created in contrast to the belittled creativity of the commoners: peasant dances, popular folktales, the music of travelling bards and community tradition, all these were castigated as mindless, derivative and fundamentally uncreative, in large part because they were collective or common practices, which had little place for naming a single original artist or author and which were difficult to commodify. Further, this enclosed form of “creativity” made a fundamental if artificial separation between the fields of arts and culture and the realms of everyday life, discounting the creative work that is an integral part of raising children, cultivating community, telling stories, tending gardens and reproducing social life more broadly. Women, who had long been cultural leaders in commoners’ communities, were now dismissed as incapable of “real” creative genius and excluded from the canon of great artists, authors and creators. The phenomenal cultural work of non-European civilizations was dismissed as merely the semi-conscious playing out of cultures locked in time, unable to achieve true creative innovation, capable only of reproducing old forms. 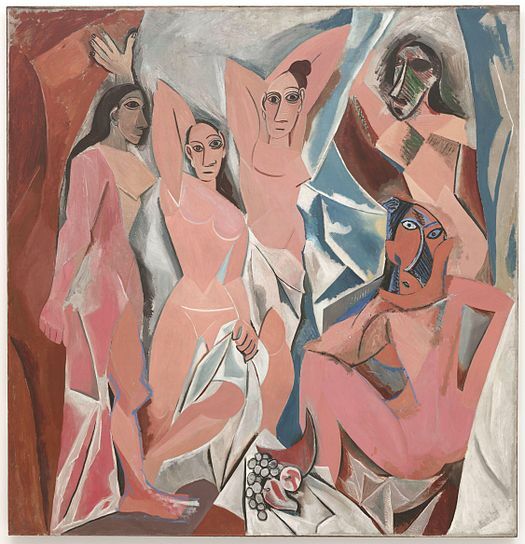 Or, worse: they became the raw aesthetic material for European appropriation and enclosure, as in the case of the “primitivist” art movements, emblematized by painters like Picasso. This should not lead us to dismiss or reject the incredible European cultural and creative treasures of the modern, capitalist period. Nor should it encourage us to devalue the importance of gifted individual creators. But we ought to recontextualize them. No artist, composer or novelist exists outside a society that produces the food they eat, the clothes they wear, the tools they use and the community on whom they rely. In turn, no creative producer creates in a vacuum: they speak back to that society, and help to shape it, often in very subtle but not unimportant ways. Further, while capitalist storytelling encourages us to remember cultural history as a parade of great men, of isolated, iconoclastic creative geniuses, the reality is that, as important as each character may indeed be, each existed as part of a community of other creative producers: critics, collaborators, rivals, friends, patrons, neighbours, and on and on. Each relied on a commons pool of cultural meanings, ideas, forms, styles, and techniques pioneered by previous generations of creative producers, and in turn contributed to this pool. And here again, the rhetoric of creativity is enclosed: as cultural critic Angela McRobbie pointed out more than a decade ago, in this brave new world, the artist has ceased to be seen as a dubious character at the margins of capitalism and has instead been cast as a “pioneer” of the new economy. Who, moreso than the artist, represents the archetypical worker in an age of uncertainty, individualism and reputation-based competition? Who better than the idiosyncratic, iconoclastic artist who refuses to be tied down to a single employer and who distrusts bureaucracies and paternal institutions? Indeed, we are all increasingly encouraged to understand our career aspirations as if we, too, were artists, members of the sanctified “creative class,” seeking to find in work not merely compensation but also “intrinsic” rewards, reputational payback and a whole personality or lifestyle. Of course, actual work in the “creative industries” is usually fairly remote from gushing idealism of the neoliberal boosters with its upscale live-work lofts, lofty airport departures lounges and MacBook-filled cafes. The reality is one of precarious, part-time, temporary and, increasingly unpaid work as internships become a compulsory right of passage and as debt becomes the norm thanks to the escalating necessity of expensive university credentials. The vast majority of “creative” workers are essentially subsidizing their creative pursuits through other, more banal forms of employment (eg. waiting tables). The problem here is evidently more serious than merely the confiscation of a romantic language of creativity we might have once thought of as liberating (though that is a problem, for we have seen our radical lexicon relentlessly colonized by capitalist propaganda such that everything from “revolution” to “community” to “sharing” to “the commons” itself has become fodder for cynical commercial manipulation). Much of the misplaced enthusiasm for the “creative class” the “creative city” and the emergence of the “creative economy” is based on a more or less true observation: that we are all, inherently creative beings. But the reality is that, today, most of us must commit this creativity to the banal routines of daily survival under austerity neoliberalism, one in which all of life’s risks and hardships are downloaded onto the individual and where nearly every sphere of life has been opened to the competitive drives of the market. It is also true that, in an age of sophisticated computer technologies and ubiquitous mobile phones, many of us now have at easy disposal tools for doing creative work and sharing it in phenomenal new ways, from art and design to music, from online publishing of fiction and poetry to photography and film-making, though we dare not probe too deeply into the seizure of creativity from workers hyper-exploited in the iPhone/MacBook global supply chain that make such creativity possible. Yet we have, somehow been forced to accept these new opportunities at the expense of any collective creative power to transform society, to open up questions of economic and social organization and, importantly, power to creative critique and transformation. As the opportunities for a highly individualized form of capitalist creativity have in some ways become democratized, the substantial opportunities for common creativity have been largely enclosed. How then to respond? To my mind, the key is to recognize and valourize the creativity of the commons, to think carefully about the ways in which collective creativity is being practiced and actualized in efforts to defend and expand those common elements of our lives. This is not simply a matter of inserting or integrating more “culture” into our common projects, though of course music, theatre, visual art and design are essential components of common spaces and practices. Indeed, these cultural forms help us build stronger, more resilient and powerful communities because they speak to and reveal, somehow, that ineffable quality of collective action: the odd and inexplicable way that “we” are more than the sum of our parts, the way that, when we work together based on non-hierarchical, grassroots democratic egalitarian principles, we are able to generate tremendous creative capacity and also transform ourselves in profound ways. It is this collective, cooperative capacity that I think we need to value and honour as creativity of the commons. This is the creativity that emerges in the long radical democratic meetings of cooperatives, in the streets as protesters collectively evade and outmaneuver police, in the anti-oppression training sessions where we learn to unpack and undo the forms of privilege and power that divide us, or in the everyday labours of collaboratively reproducing life outside the market’s discipline. Let’s close with a few brief interesting examples of what might be termed art towards the common. I say “towards” to note that all creativity is, as I have been arguing here, always partly common, but that we usually fail to acknowledge it as such. But the practices I will gloss here are explicitly oriented towards using the power and the unique historical and social position of “art” to help us foster and reimagine the commons. Caroline Woolard is a New York City based artist who specializes in creating common environments and resources for the commons. 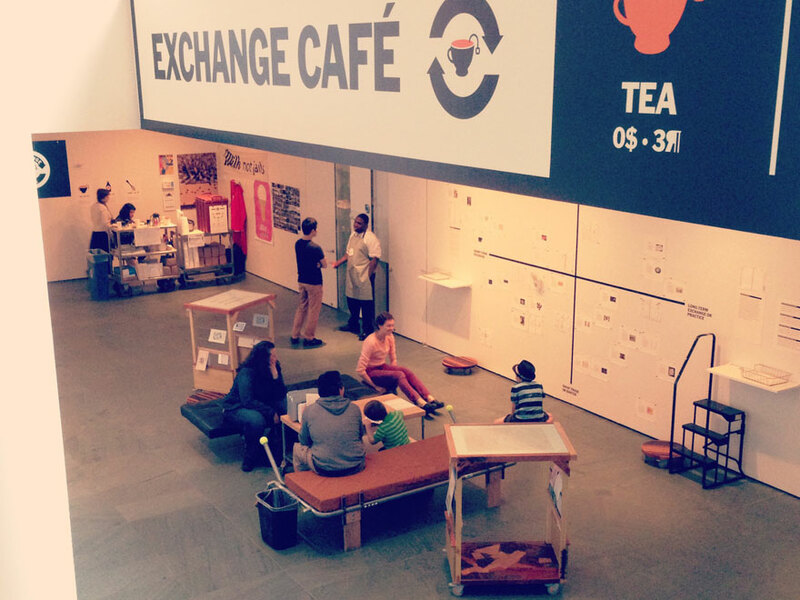 She describes her work as “researched-based and collaborative” and aimed at “co-creat[ing] spaces for critical exchange, forgotten histories, and desire inducing narratives.” For instance, in a 2013 temporary project at New York’s Museum of Modern Art, Woolard established an “Exchange Café” in which gallery-goers could obtain tea, milk and honey but were advised that “this establishment does not accept credit cards, debit cards, or national currencies. 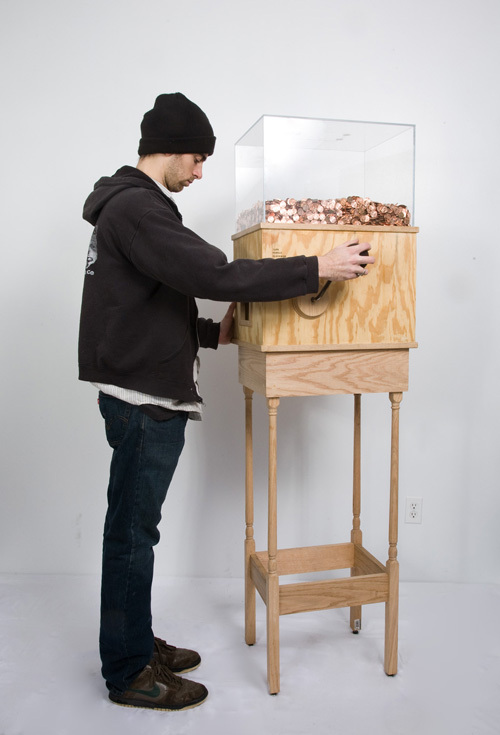 We accept your individual labor, goods, ideas, and/or services in exchange for our products.” But beyond creating unconventional works and experiences for the “art world,” Woolard’s practice extends into collaborations to create new resources for the commons in the broader community. For instance, she has helped establish OurGoods.org, a web-based platform to enable bartering in New York City, and TradeSchool.coop, an open-source scheme that allows communities to establish their own schools for commoners to share their skills, talents and knowledge, again, based on the principles of non-monetary exchange. In all this work, Woolard turns her own impressive creative talents and energies towards generating spaces, process and opportunities to cultivate and activate more common, collective and community-based creative potentials. She is not simply “doing” art with the public, but creating the possibility for commoners to realize and recognize the creative dimensions of working together, and, by extension, the ways in which this creative power and potential is almost everywhere enclosed under today’s capitalist system. Such a practice is rooted in a deep and long-term commitment to building radical democratic community, to communing. Mi’Kmaq artist Ursula Johnson is also actively working on what we might understand as the commons, but in a very different idiom. Based in Halifax and Cape Breton, Canada, Johnson’s work focuses on honouring and reinventing the artistic traditions of her Indigenous ancestors, traditions that have been the target of the Canadian state’s genocidal policies since colonization. For instance, in 2010 Johnson curated an exhibition of the basket-work of her grandmother, famed Mi’kmaq artist Caroline Gould, affirming and valourizing both Gould’s unique genius and talent as well as the broader cultural “commons” of knowledge and skill which has been handed down generation to generation for centuries*. But Johnson is also a phenomenal basket-weaver in her own right, and has worked with this form to create works that speak to today’s social and political issues, including queer rights and identity, the violent colonial management and surveillance of Indigenous people (past and present), and the migration of Indigenous peoples to cities. Johnson also uses basketwork in powerful public performances that compel both Indigenous and non-Indigenous audiences to attend to and recognize the ongoing legacies of colonialism and genocide. In this sense, Johnson not only draws on a heritage and history of common creativity, but also seeks to create opportunities for common reflection and reconsideration. Importantly, Johnson’s work does not offer us an easy or celebratory vision of the commons. Rather, it forces us to think about how past and present oppression, inequity and violence presents a barrier to creating new commons. This is art towards the common, but also art towards the uncommon, art that troubles or complicates the common. To these examples we might add the wide variety of artists, musicians, playwrights, writers and others who are committed to creating non-commercial public events to bring communities together, or who do the important work of either inspiring or questioning common projects. We are seeing, across a range of media, the emergence of new, experimental forms and practices that take as their task not simply the creation and possibilities of aesthetic beauty (which remains important), but also the revelation of our common capacities, the beauty of cooperation, and the possibilities for a world beyond enclosure. In this sense, we are perhaps rediscovering, or at least learning to value once again, the creativity of the commons and the commons of creativity. * It should be noted that the interpretive frame of “the commons” here is mine: the Mi’Kmaq language has other, better, older words to describe with greater precision and care similar themes. For instance, see Martha Stiegman and Sherry Pictou. 2010. “How Do You Say Netuklimuk in English? Learning through Video in Bear River First Nation.” In Learning from the Ground up: Global Perspectives on Social Movements and Knowledge Production, edited by Aziz Choudry and Dip Kapoor, 227–42. London and New York: Palgrave MacMillan.